About a week ago I took Will with me to buy all the necessities to make easy DIY bracelets and our family management binder. Out of the very many pins I have plastered both in my mind and my Pinterest board I chose to get started on this one because we really need it, and I mean REALLY need it. As a 19 year old and a 22 year old, our minds are still maturing and unfortunately the organization part of it really hasn’t been on the right track. So this was the perfect start. Alright. 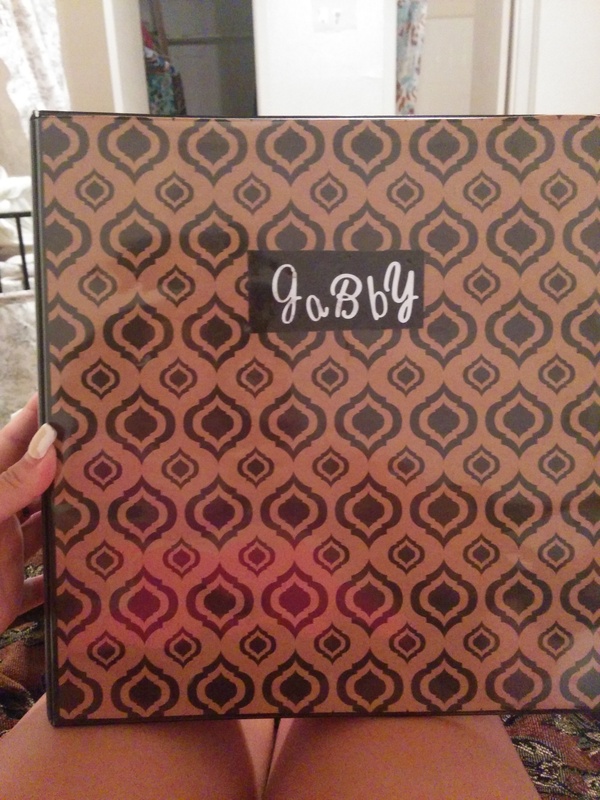 The front cover of the binder looks as it does in the top left hand corner. I made it using a book of different scrapbooking paper from Wal Mart which only cost around $5.00. It came with a variety of patterns and they were super cute. I used silver script stickers to put my name on it. The first section has filler paper for notes and a wonderful printable calendar which I got for free at the “Filthy Muggle”. Super cute designs. My fave out of all of the ones I have seen on Pinterest. 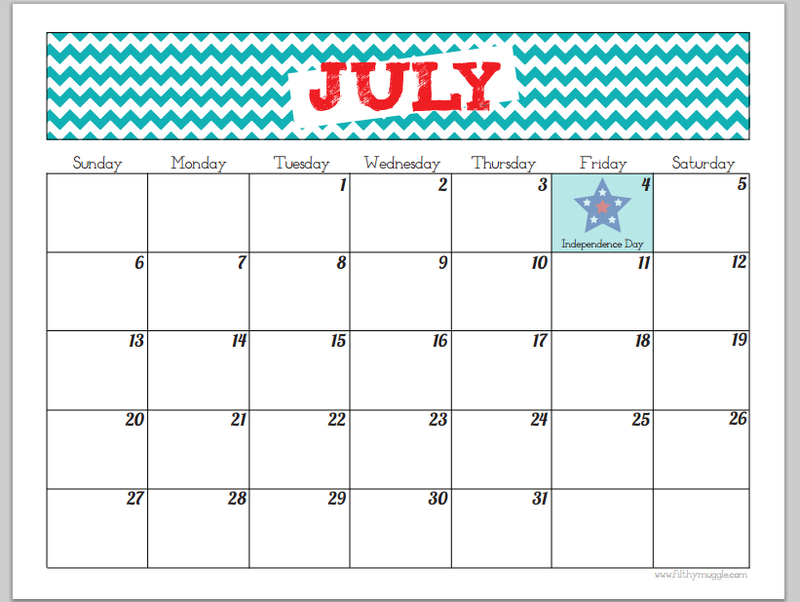 If you’re interested in having a calendar ready for your family, school, workouts, etc., go ahead and take a look! The second section is our “Month At A Glance”. I stole the idea from here. 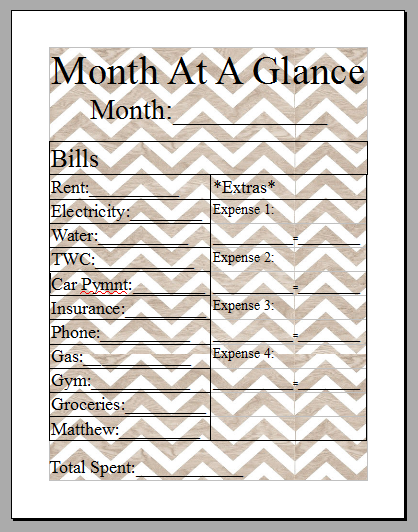 She even has a free printable budget binder and other binder printables as well! Gotta love it. I didn’t stick with that version though because I wanted mine to be specific to our bills and finances. And I didn’t need all of the other sections either. I made it on my own with Open Office. It’s a super awesome FREE program that is almost identical to Microsoft Office. If you’re on a budget but need a program like this I highly suggest it. In our Month At A Glance section I also have envelopes for each of our bills that need to be paid. The money may go in there but it quickly comes out as well! Haha. Our last section that I made today was the grocery shopping section. I love, love, love, the free editable PDF I got from Grocerylists.org. Such cool features with this shopping list including the list which has every item you could think of on it, and the fact that you can edit it. The best part is at the bottom the people who created this list asks you to kindly leave the list in the shopping cart when you’re done with it. It also has an address on there to send it to if you come across one. Why would the do this you ask? To post them on their website and see all of the funny and awesome grocery lists people have been leaving out there! How cool. Thats all I have put in our binder today. This gets me so excited for school this Fall! Haha. I want to add a section for our work outs but I have to sit down and organize that with Will first! Anyways, hope yall have an awesome day and thanks for stopping by and reading! Enter your email address to follow Matthew's accomplishments and receive notifications of new posts by email. T. D. Davis on Update….